Texan Girl Talks: It's One Special Day. Today is a day that I am so grateful for because today is my husband's birthday. This old man is turning 28. I officially am married to an older man again and feels amazing. Yes, we are 6 months apart, but I squeeze all I can out of those 6 months of being the younger in this relationship. 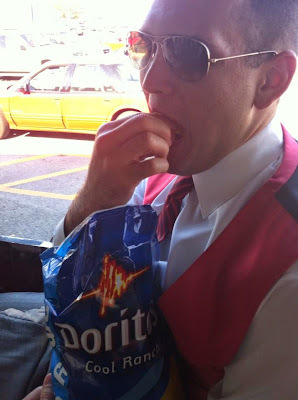 Clearly, there is little different between home vs public Doritos..
His nickname is Coatesy Bear. He is kind of furry like a bear and often gets confused with an actual bear. All the academy kids will get this. Which incidentally can look like this when hungry. Don't worry I keep my distance. He would love nothing more than to have a million Nalgenes. The water bottles. The man is obsessed. We have approximately 785937459873485 that he consistently only puts smoothies in. Do you know how hard it is to clean smoothie out of these?! Difficult. This fun fact I get to brag.. This hunk of burning love is also promoting today. He is one of the hardest working people I know. For example: 6 months straight, he would go into work before 4am to work until 6pm just to make sure all would get done and try to alleviate stress on the rest of his office. He always stays so humble and never takes credit for anything. I love you, Matt and am so proud of all you have accomplished. You deserve this. I hope you have the happiest of birthdays.